Both benign (non-cancerous) and cancerous salivary gland tumors may develop anywhere in the salivary glands, but the majority of them are parotid tumors. 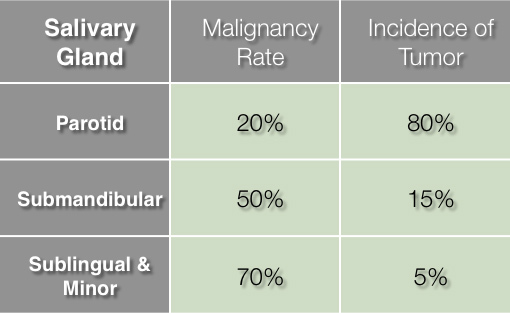 In fact, as many as 80% of salivary gland tumors begin in the parotid glands. 15% occur in the submandibular glands, and 5% form in the sublingual and minor glands. While most salivary gland tumors occur in the parotid glands, only 20% of them are cancerous. With this in mind, we want to stress that it is important that you come see us if you are find a mass in your parotid gland so we can perform a biopsy. This will allow us to determine whether a growth is cancerous or not, and in turn come up with a treatment plan that may require parotid surgery on the tumor. 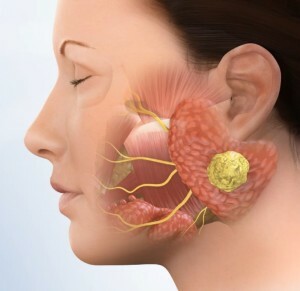 Parotid cancers not only tend to grow in the gland itself and destroy the surrounding tissue and nerves, but also spread to the lymph nodes and even other parts of the body. The parotid surgery treatment type of these tumors is based on the type of cancer. Early diagnosis of the cancer is obviously of utmost importance, because it leads to a less extensive surgery, less complications and much better outcomes. All masses in the parotid gland should be carefully assessed and diagnosed, usually by performing a needle biopsy. In advanced cases, pain and facial paralysis can develop due to a parotid gland cancer. The most common symptom of salivary gland cancer, however, is a painless mass. Exposure to radiation is the most well-known cause of salivary gland cancer. This includes environmental exposure and radiation therapy for cancer of the head or neck. To ascertain the extent of the tumor, an MRI scan of the face and neck may be indicated as well. When surgical removal of a salivary gland becomes necessary, it is of the upmost importance than you consult an experienced and qualified Head & Neck Surgeon, such as Dr. Larian. He has extensive experience with parotidectomies and minimally invasive parotidectomy, and would be happy to help you. Pleomorphic adenoma is, by far, the most common benign salivary gland tumor, accounting for as many as 80% of all parotid tumors. Although pleomorphic adenomas most commonly occur in the parotid gland, it may also be encountered in the submandibular, lingual, and minor salivary glands. Pleomorphic adenoma has a tendency to continuously grow, and has the potential of becoming cancerous. Warthin’s tumor is a type of benign tumor of the salivary glands, and the gland most likely affected is the parotid gland. Only pleomorphic adenoma is a more common benign parotid tumor. Warthin’s tumor is slow growing, painless, and primarily affects older individuals. The tumor can happen on both sides. Mucoepidermoid Carcinoma is an abnormal growth of tissue resulting from uncontrolled, progressive multiplication of cells, serving no physiological function. This is the most common type of salivary gland malignancy in adults. 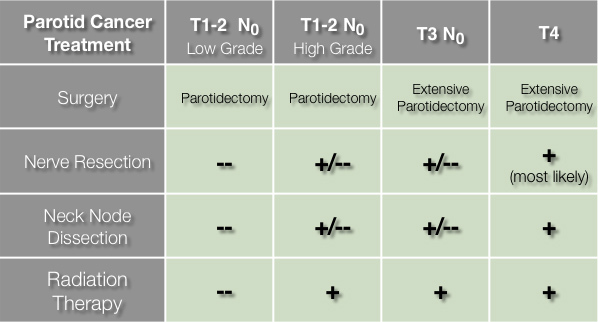 It can be low grade and not very aggressive which can be treated by parotid tumor surgery alone, or intermediate grade & high grade which require extensive parotid surgery, lymph node removal followed by radiation therapy. The parotid tumor usually forms as a painless, slow-growing, fixed mass that is firm or hard. These tumors vary widely in duration, and sometimes go through a phase of accelerated growth which is often a warning sign that a tumor has become more aggressive. This is most commonly a parotid tumor that presents itself as a slow growing mass. These tumors vary in their behavior, from locally aggressive to blatantly malignant, and are sometimes associated with pain or tenderness. Acinic cell carcinoma appears in all age groups, but presents at a younger median age (52 years) than most other salivary gland cancers. In rare cases they can occur on both sides. This is a rather rare type of cancer that can exist in many different body sites, although most commonly in the salivary glands. It is the third most common malignant salivary gland tumor overall. It is a very unusual tumor in that can grow slowly but has a liking for nerves, and tends to use them as a “highway” to travel to other parts. Early lesions of the salivary glands present as painless masses of the mouth or face, and usually grow slowly. Advanced tumors, meanwhile, may present with pain and/or nerve paralysis. 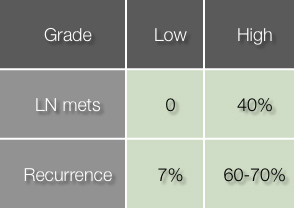 Early tumors can be treated and cured by surgical treatment and at times post surgical radiation therapy. However, more advanced tumors are difficult to cure. Early diagnosis is of utmost importance. When the tumor has involved the facial nerve, in order to achieve cure, the facial nerve must be treated, either by surgical removal of the nerve or by radiation therapy; this is a very challenging clinical decision, and each case is considered individually. Squamous cell carcinoma is the second most common form of non-melonoma skin cancer; in advanced cases the tumor may spread from the skin of scalp or temple to the lymph nodes in the parotid gland. When the squamous cell cancers spread to the parotid, the treatment will include parotidectomy, possibly lymph node dissection, followed by post salivary gland tumor removal radiation therapy to both the parotid and the area of the original skin cancer. This is a type of cancer that initially started off as a benign parotid tumor, Pleomorphic Adenoma. 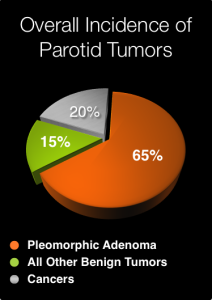 Although pleomorphic adenomas are benign parotid tumors, it has the 10% chance of turning into a malignancy at 15 years. The incidence of malignant transformation increases with time. Signals of malignant transformation include facial weakness, pain, skin invasion and fixation to the surrounding tissue, rapid growth, and facial numbness. These are very aggressive tumors that are treated by radical parotid surgery followed by post-surgical chemotherapy and radiation therapy. Due to the aggressive nature of this tumor, and poor cure rate, it is advised that benign Pleomorphic adenomas be removed to prevent transformation into this cancer. Due to the fact that there are several lymph nodes inside the parotid gland, there is a low incidence of parotid gland lymphoma. Lymphoma is not a type of cancer that is treated by surgery, rather by either chemotherapy or radiation therapy based on the type of lymphoma. But due to the fact that the facial nerve is in close proximity of the lymph nodes, in order to diagnose the lymphoma, at times, the patient must undergo a parotid surgery in order to get an adequate sample for diagnosis while avoiding injury to the facial nerve. If you would like to schedule a consultation with a parotid tumor expert, Dr. Larian, give us a call at (888) 687-6118 today! Next, learn about deep lobe tumors.